Lecture by Kyla Wazana Tompkins, "So Moved: Ferment, Jelly, Intoxication, Rot"
Kyla Wazana Tompkins, "So Moved: Ferment, Jelly, Intoxication, Rot" on Friday, April 13 at 4pm at Fordham University's Lincoln Center campus. Summer and Fall 2015 feature an array of interesting English graduate course offerings. A seminar on Horror and Madness in Fiction and Film is being offered in Fordham's Summer Session 2. The course counts for an American 2 or Elective Requirement and is open to non-degree students. The Fall 2015 English graduate course schedule includes Research Methods; Theatrical Enterprise in Early Modern England; Romanticism and Private Life; Eighteenth Century Travel; Memory, Trauma, Narrative; Approaches to American Literature Before 1900; 20th Century American Novel: A Violent Survey; Themes in Pre-Conquest Literature; and Late Medieval Women. Two creative writing options include a Master Class on The Short Story and a Playwriting Workshop. For continuing graduate students, registration begins on April 7th for Summer and Fall 2015 English Graduate Courses. Students who are not matriculated at Fordham may apply for non-degree enrollment now. For further information, please contact Martine Stern at marstern@fordham.edu. Fordham English PhD student James Van Wyck is arguing in his dissertation that 19th-century Evangelical texts relied heavily on an appeal to readers’ emotions, a technique born from a sentimentalist ethos that continues to inform Evangelical reading habits today. His research has led him to curate an exhibition on evangelical fiction at Drew University, and was recently covered in an extensive story in Inside Fordham. Scholars have linked this anti-intellectual bent to a variety of influences—for instance, the growing insularity of the Evangelical community, or the sway of charismatic church and political leaders. However, James Van Wyck, an English doctoral student in the Graduate School of Arts and Sciences, believes that it in fact stems from something seemingly innocuous: the last century-and-a-half of fictions that Evangelicals have been reading and writing. To prove his point, Van Wyck has taken a daunting plunge into the archives to chronicle Evangelical literary trends and how these have influenced contemporary Evangelical thought. He argues in his doctoral dissertation that 19th-century Evangelical texts relied heavily on an appeal to readers’ emotions, a technique born from a sentimentalist ethos that continues to inform Evangelical reading habits today….. Read the full story by Joanna Mercuri. In the mid-19th century, writers of Christian fiction had to be creative to get their stories to a population that was spread out geographically and didn’t always have easy access to books. 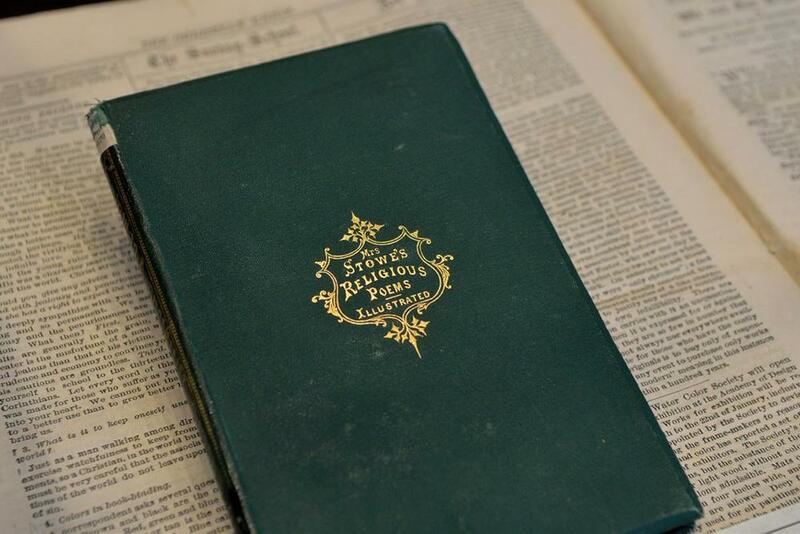 Van Wyck and Christopher Anderson, Head of Special Collections, Archives, and Methodist Librarian for the Drew University Library, have joined forces to present an exhibit highlighting some of these historic gems. Drew’s rich collection reflects an array of authors—women authors, bestselling novelists, African-American authors and writers of children’s stories…..Read the full story on Drew University’s site.